While four North Carolina A&T alumni were recently honored Sept. 21-25 for their significant contributions to their business sector, alma mater and throughout society at the 2016 National Black College Alumni (NBCA) Hall of Fame, the current Miss A&T also participated in the annual event. 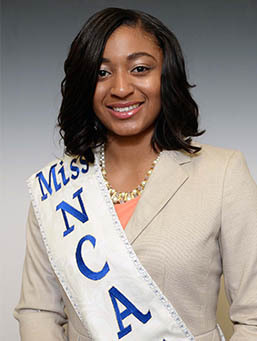 Representing N.C. A&T’s royal court, Jasmine L. Boles was a top-10 finalist in the NBCA Competition of Black College Queens and was the winner of the “Spirit of Entrepreneurship” award. For the talent portion, Boles sang a rendition of “Still I Rise” by gospel artist Yolanda Adams; performed an oratory titled, “Black Colleges are the Roots of the Black Community; engaged in an interview session with a panel of judges and participated in the evening-wear competition. The group of queens also participated in various outreach activities; speaking to high school students and sharing their experiences. The competition is a tribute to young women attending Historically Black Colleges and Universities who have chosen to strive for excellence through education and to better prepare for the future. It encourages contestants to gain self-awareness, self- confidence, individual pride, pride for their institution and a greater social awareness. Participants are expected to apply principles of effective speaking to improve their ability to communicate effectively, apply principles of articulation in front of an audience comfortably and discuss and explain their platform successfully. While the program places emphasis on excellence, achievement and personal growth, it also provides for a fun and engaging atmosphere. The queens also participated in the Queens Luncheon, the Queens’ Tea, the Positive Image Program, and various self-improvement empowering workshops.